As a professional woman in the workplace, positioning yourself for career advancement means more than understanding the clear-cut obvious skills required for your success. What is really critical for your advancement is that you master the small but powerful skills that are often unwritten and unspoken - e.g. how to successfully manage the key players in your professional network and inner circle. If understood, practiced and ultimately mastered, these types of skills can help prepare and position you for career advancement and on-going success. 3. How you can create your own blueprint to engage others within your organization to support your career. Francine Parham is the Founder and CEO of FrancineParham & Co. Her work focuses on the advancement of women in the workplace. 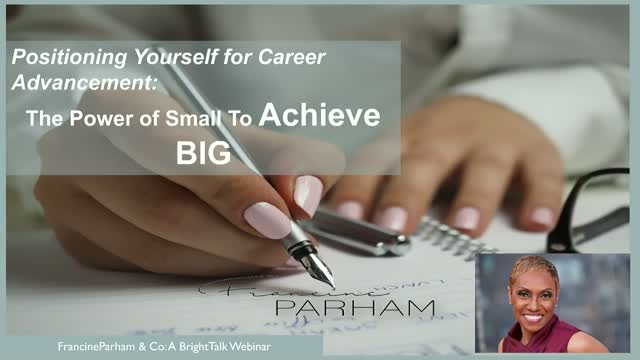 Having spent two decades in the corporate sector advancing to the position of a global vice-president in two Fortune 500 companies, she understands the importance of having the right skills (unwritten and unspoken) to achieve professional success. She shares the actions and approaches that you can take to prepare and position yourself for career advancement through her public speaking, writing, curated and micro-networking events and specialized skill-building workshops. She is also the co-author of the book, “The Ultimate Career Pocket Guide”. Francine has written for various online platforms and has been cited or recognized as a career expert in various published books. Visit FrancineParham.com for more information about her and her work. Francine Parham, Founder and CEO, FrancineParham & Co. Presented by: Francine Parham, Founder and CEO, FrancineParham & Co.